Have you ever wonder how interior designers can make such great colour scheme choices that just seem to….. well work?? Colour is such an important tool when it comes to interiors. Colour has the power to make or break a space. Colour creates mood, can alter the perceived size of a room and be used to define areas. Designers are trained to know which colours compliment which and where best to use those colours. But what if you do not have the resources to hire a designer?? Don’t fret!!! Below is some useful info on the colour world. At school you probably learnt about primary colours. Hands up if you remember what they are………. I’m impressed, you remembered!! Yellow, Blue and Red. 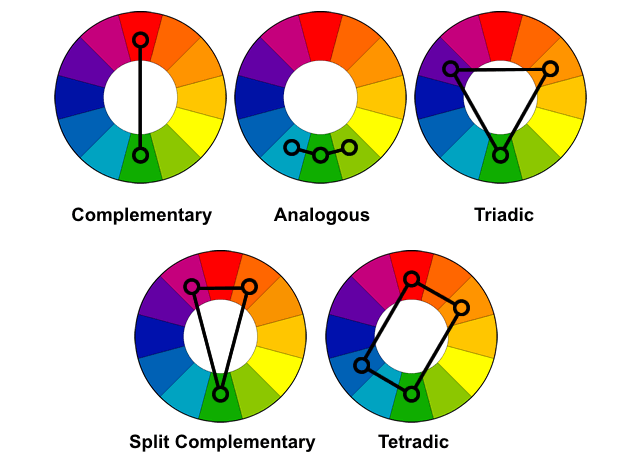 Below is the standard colour wheel used by designers to help make colour choices. As you can see there are more than just the three primary colours in the wheel. Secondary Colours – The colours created from mixing the primary colours together, Green, Orange and Violet. Tertiary or Intermediate Colours – The six colours created when mixing the primary with secondary colours, i.e Yellow-Orange, Blue-Green, Red-Orange. Red, clockwise to Yellow-Green are considered warm colours, whilst Green around to Red-Purple are considered the cool colours. Then you have the neutral colours, not included on the colour wheel. These are White, Black and Grey. Hue – refers to the main colours of the wheel, i.e blue, green or red. Tint – Hue with ‘White’ added. Tone – Hue with ‘Grey’ added. Shade – Hue with ‘Black’ added. Ok that’s fine, but the how do you use the colour wheel??? Below are the standard rules in which to choose colours that work together. Complimentary – Two colours placed opposite each other on the wheel. Utilised one colour as the main and then other colours as an accent. When used can create a high contrast. Also works with tints and shades, I.E Light blue with a darker orange. Analogous – Three colours placed next to each other on the wheel. Opting for tints rather than hues works best here or the colours will appear overpowering. It is also advisable to avoid mixing cool colours with warm. Triadic – Three colours that are spaced equally apart on the wheel. Again creates high contrast and works well with one dominant colour with the other two as accents. Split Complimentary – One colour is matched with the two colours adjacent to its complementary colour. This choice is best for beginners. Tetradic – Two sets of complimentary colours used together in a group of four colours. One of the hardest scheme to put together. One dominant colours with the others working as accents and avoidance of using pure hues is the key. Once you have made an initial choice of colour from the wheel for an interior, it makes the remainder of the task easier. If after all the above you are still unsure of what colours will work for you, don’t forget that most paint companies like, Dulux. Taubmans and British paints have on-line colour scheme suggestions and web tools for you to play around with, so you can choose colours that not only work for you and your space but also with each other. Now go and colour the world…… or at least your home. Next time we will look at The Psychology of Colours and their meanings. Love this post! This is something I’ve been wanting to learn about for awhile now. Can’t wait to follow the rest of this series!